Island Conservation Communications Volunteer Emily Heber is interviewing staff that work “behind the scenes” of Island Conservation (IC). We are sharing a series of interviews with these staff to shed light on who they are and what they do to support IC’s mission. 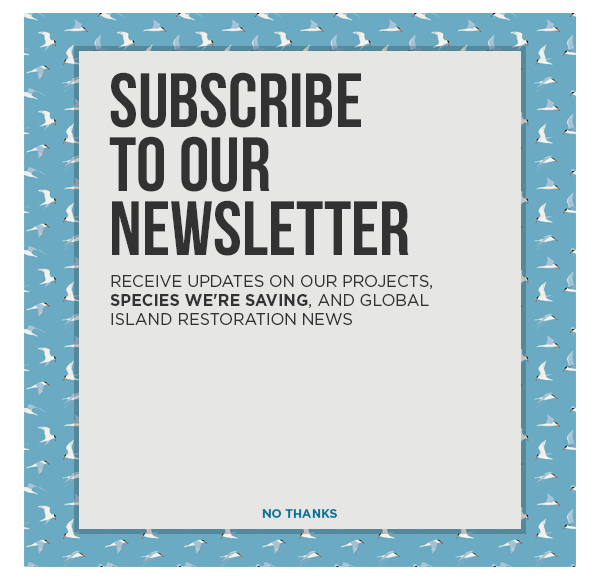 The following interview was conducted with Island Conservation’s Philanthropy Specialist, Julia Dunn. Emily: What is your role at Island Conservation? Julia: I am the Philanthropy Specialist at Island Conservation. I manage small donor relations, small grant writing opportunities, event planning and support, board meeting preparation, financial forecasting, Salesforce database management, mailings and research. Emily: What do you like most about your job? Julia: My favorite thing about my job is that every day is different for me. I work with each department quite a bit and I enjoy being involved in different aspects of our work. Emily: What is most challenging about your job? Julia: Also that my tasks vary every day. Some days are more relaxed and I have time to catch up on research, but most days are busy. Emily: What has surprised you most during your time at IC? Julia: I’ve been inspired by how much positive change a nonprofit of our size can make in the world. Island Conservation has a relatively small staff size compared to some of the larger NGOs, but with strong partnerships and supporters, we have a big positive impact on biodiversity around the world. Emily: What personally motivates you to work at IC and support our mission? Julia: My educational background and interests are centered around science, so it has always been important to me that we conduct thorough research and that we follow up each project with accurate data. I think it is important to conduct conservation measures, implement biosecurity measures, and collaborate with people from local communities to continue the work after the project is complete. These features of our conservation projects are crucial and I’m proud to be part of an organization that attends to each one with due diligence. Emily: What’s your favorite island species? Emily: What island (if any) have you been to that was really memorable? Can you describe what stood out to you? Julia: I haven’t been to any of the project sites yet but I was given the opportunity to attend the World Conservation Congress in Honolulu, Hawaii. It was amazing to be a part of such an important gathering and I was shocked to see how many people knew about Island Conservation. I enjoyed watching my colleagues receive the recognition that they very well deserve. Emily: What are you looking forward to in the coming years for IC? Julia: I’m really excited about our new programs in Bahamas and Palau. There are a lot of beautiful species at risk in these island-rich areas. I‘m looking forward to watching those communities work together to restore their local islands.